Occasionally labeled as a mere “pretty face,” mainland Chinese actor Huang Xiaoming (黃曉明) surprised viewers in his recently released film, American Dreams in China <中国合伙人>, in which he portrayed a country bumpkin turned successful entrepreneur. In his next movie, Saving Mother Robot <瑪德2號>, however, Xiaoming will be gracing the big screen with his handsome image once more, appearing as a photographer alongside Taiwanese actress Vivian Hsu (徐若瑄). 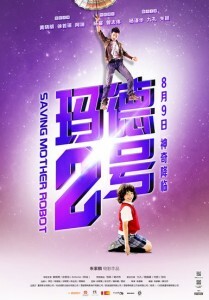 Saving Mother Robot, which is the first feature-length film written and directed by Taiwanese director Ga Lun Jue (朱家麟), tells the story of single mother Cao Yi (Vivian Hsu), whose everyday life consists of her finding ways to make money and raise her young son, Xiao Hu (child actor Ah Duan 阿端). However, Xiao Hu feels that his mother does not have enough time to spend with him, so he frequently acts out in response. He also fantasizes that his mother will turn into the legendary “Madeleine” robot. Coincidentally, Cao Yi’s superior sends her to become an assistant to Xiao Tie (Huang Xiaoming), an eccentric photographer whose hobby is obsessively searching for UFOs. Because Xiao Tie was also raised in a single-parent home, he interacts with Xiao Hu in interesting ways and ultimately helps the young boy understand his mother’s situation. Judging from the recently released promotional poster and preview, as well as the various stars peppering the cast list – from Hong Kong actor Eric Tsang (曾志偉) to Taiwanese actress Cheryl Yang (楊謹華) to mainland Chinese actress Yang Mi (楊冪) – one might think that Saving Mother Robot is yet another idol film, with not enough substance to merit the style. Nevertheless, the story is extremely touching and mixes science fiction and comedy into a form appealing to people of all ages. Moreover, the collaboration between Xiaoming and Vivian makes for a fresh pairing, and child actor Ah Duan, who is of Chinese-Brazilian heritage, is sure to shine as another highlight in the film. 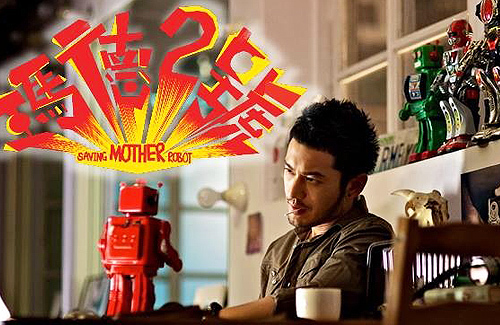 Saving Mother Robot will open in theaters on August 9, just four days before the release date of Crimes of Passion <一場風花雪月的事>, which stars Huang Xiaoming’s girlfriend, Angelababy (楊穎). Xiaoming makes a guest appearance in the film. I swear he’s in like everything! Is there no one else?? There are plenty of actors in China but I guess they are just not known yet. I would always prefer Chen kun over him. chen kun is good, goodlooking and good in acting. i only see a few movies with HXM, he sometimes overacts. I stopped favoring him after he changed his face. Although a pretty boy face now, it doesn’t hold any attraction. No more the old, impish, well built, healthy, cutie HXM!